Metal Garden furniture is long-lasting and practically maintenance free. We have chosen to sell Cast Aluminium Garden Furniture ,rather than Cast Iron or Wrought Iron garden furniture because Aluminium Patio Furniture does not rust. Lazy Susan Furniture specialise in metal patio furniture including Round 180 cm , 8 -10 seater Cast Aluminium Tables, Round 150 cm, 6- 8 seater aluminium tables and Round 120cm, 4-6 seater metal tables. We also have a range of Oval 8-10 seater cast aluminium patio furniture sets and some lovely Oval 6-8 seater metal garden furniture sets. The 2009-2010 Garden Furniture collection also includes several 2 seater metal garden benches, White Bistro Tables,Green Bistro Tables and Antique Bronze metal Bistro sets. Coffee tables in cast aluminium, metal side tables and sun loungers are also available. Iron Garden Furniture,including Cast Iron and Wrought Iron Garden Furniture is both very heavy and Iron is suseptible to rust. Whereas our range of cast aluminium patio furniture is totally maintenance free, it will not rust. Simply keep it clean with soapy water, the same way that you would wash your car. Our metal garden furniture is designed to be left outside all year round, and unlike teak or wooden garden furniture it does not need sanding, varishing or regular staining. Based near Chichester in West Sussex our small family run business is a specialist firm of garden furniture suppliers and specifically furniture for the garden made from aluminium. For some time we attempted to maintain teak garden tables and other similar furniture but to no avail. So it was decided that the best long term solution was to use metal for garden furniture and in particular aluminium, due to its numerous benefits and qualities. Metal garden furniture made from aluminium does not rot nor does it rust, furthermore, it is maintenance free and will not need to be replaced every few years as is the case with other materials. It can also be left outdoors all year round so you don’t have to worry about constantly taking the garden table and chairs indoors or covering them up each time it rains or when it gets cold. In March 2007 we launched our range of furniture after spending a lot of time searching for the perfect furniture sets. Our aim was to find the best quality aluminium garden patio furniture on the market that was built in a classic design that would still look in fashion in years to come. Since then we have sold hundreds of different furniture sets all of which have been successfully delivered to all corners of the country. Overall we are confident that customers will love our furniture as an alternative to cast iron garden furniture for the main reason that it will never rust. No-one disputes that the weather in the UK is unpredictable to say the least, which is why a furniture set for the garden that can be left outdoors unprotected at all times is ideal for this country. When you buy a large round garden table from us, you will be getting a top quality cast aluminium table that will require zero maintenance and that will look elegant now and in the future. Simply having a table is clearly insufficient which is why we have a range of garden furniture sets in a range of styles and sizes to suit all requirements and budgets. If you are simply looking for a few chairs to match an existing table or to augment existing furniture sets then we have a couple of styles to choose from. The Emma metal stacking chair is available in a choice of antique bronze, verdigris and white and at eight kilos is a very solid chair that can be stacked away for winter storage. If you need some cushions to go with the chairs then our choice of high back cushions are available in stone, navy blue and apple green, colours which we feel suit the colours of the metal chairs. Wrought iron garden furniture is undoubtedly for some people, but we are confident that in time people will start to move towards aluminium furniture as it is equally elegant but far easier to look after and we will see more garden furniture UK stores supplying it. There is a lot of talk of how only garden furniture made from iron can have a traditional look and that other materials are simply trying to imitate this superior metal. However this is simply not the case. A garden table can have a classic appearance in a range of different materials, however some are simply harder to maintain than others. If you have the time and energy to properly look after teak wood furniture then you are amongst a lucky minority who can. The majority of people who want a set of garden tables and chairs have the time to enjoy them now and again, but not necessarily the time or inclination to uphold them properly. 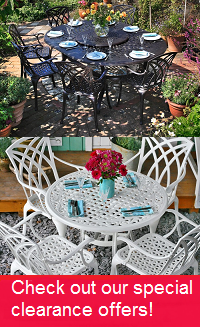 For those with a large garden who enjoy entertaining friends and family it is certainly worth investing in a quality set of cast aluminium garden furniture. As once you have spent the money and the furniture is set up nicely in your yard, you will never have to replace it. In fact once its there, you wont have to do anything other than enjoy it. The Gloria model is a particularly stylish furniture set for the garden and comes with ten chairs and a revolving Lazy Susan that sits on the metal table top. This metal garden furniture set is made from cast aluminium and so is completely weather proof and thus you will never have to move it after it is set up as you would with cast iron garden furniture. For those who have already bought a nice set of garden furniture from us, or who are thinking of getting an additional piece of furniture, then our range of metal garden benches should be considered. First we have the Jasmine Weave Bench, which is an ideal complement to the Madison Rectangular Table or simply as a stand alone item in a quiet sunny sport in the garden. Navy blue or stone are the choice of colours for matching seat pad cushions that come included with the price of the bench, and if you want a coffee garden table then we have some for you to choose from that will match it nicely. All our garden benches are supplied flat packed and can be easily assembled in about twenty minutes. For those with a round table the Valerie is a curved metal bench that will look great as part of a contemporary garden furniture ensemble. A choice of three colours of white, green and antique bronze makes them perfect for fitting around our round and oval tables that come in similar tones. If you are looking at furniture individually and need some chairs to complement a bench, then the Mary set of stacking metal garden chairs are well constructed and have a moderate weight of four kilos per chair. They are also particularly comfortable and have been designed with an excellent contour so people can sit in comfort for hours whilst enjoy a lunch on their garden tables. If you have in mind to buy a non-circular table and matching chairs then be sure to check out our Madison rectangular cast aluminium garden set. This is a very substantial set with the garden table weighing in at around 60 kilos, and comes with eight Emma stackable chairs, although the set can be supplied as a ten or twelve seater if desired. The style is a classic one, and if you like straight edges as opposed to a rounded edge on a table then this 8 seater garden furniture set could be the one for you. If like most gardens yours has a patio area then as long as you have the space, why not think about putting a nice outdoor bench or even a small table and chairs there. Aluminium patio furniture can make for a lovely addition to an outdoor area, and our diminutive Betty Bistro table and two chairs is a fine example. In a choice of our three standard colours of antique bronze, white and green, you could perhaps acquire this timeless table and aluminium garden chairs to match a larger furniture set that may sit in your garden. Whatever the reasons, we are confident you won’t be disappointed with them, and for a small additional fee you can purchase a two metre parasol to complete the set. In fact we have a range of parasols to match garden tables, so make sure to have a look for a colour that will suit your furniture. People have different ideas as to what constitutes a good quality set of aluminium garden tables and other furniture. Some would argue the most important aspect of it is the style and design. 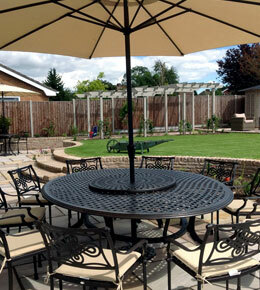 Others voice the opinion that it’s the materials used that is really crucial to the make up of garden furniture. We agree with both points of view and have attempted to combine classic, timeless designs with a quality material in aluminium. Our oval garden table collection constitutes differently styled oval tables with garden chairs and the Summer eight seater is a nice example. Complete with eight Emma metal chairs, seat pad cushions, a parasol and parasol base, the oval table itself is made from solid cast aluminium and weighs in at around 50 kilos. Of course you could find similar iron garden furniture and we would not dissuade you from going out and buying it if you are of the opinion that garden furniture has to be made from wrought iron. However, if you are undecided or simply open minded then we would urge you to weigh up the pros and cons of aluminium and iron or even teak wood, and compare styles on our metal garden furniture UK website with those sold on iron and wooden furniture websites and then decide what’s best for you. We are confident that our styles and designs are at least as attractive as what you may find elsewhere and hope you find our garden tables suitable for your garden.